Extract of Hu Zhang root, the richest source of trans-resveratrol. Associated with anti-ageing (disease-prevention, reduced inflammation, decrease in mortality). Resveratrol is a phenolic compound and part of the family of flavonoids, known for their powerful antioxidant activity. It can inhibit production of eicosanoids such as prostaglandins, thromboxanes and leucotrienes, compounds involved in inflammatory reactions and platelet aggregation. - in animals, it boosted the exercise capacity of their muscles and protected them from insulin resistance induced by their diet and obesity. As a result of its protective properties and anti-ageing effects, resveratrol is a very popular antioxidant nutritional supplement. 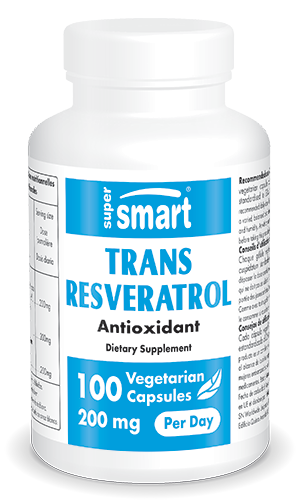 To obtain maximum benefit, choose the most active form - trans-resveratrol. This is available either as a supplement on its own or combined with other antioxidants as in the formulation AntiOxidant Synergy. A resveratrol-like compound called pterostilbene may also be of interest. With very similar chemical structures, resveratrol and pterostilbene share many attributes including significant antioxidant potency. These antioxidant effects are offered by the formulation Resveratrol Synergy which contains both these compounds.